The idea is to play on everything that is low-tuned, and to play everything that is filled with cooled polish beer, rolled cigarettes, frivolous fuzz, dust, old-timers and of course beautiful women. 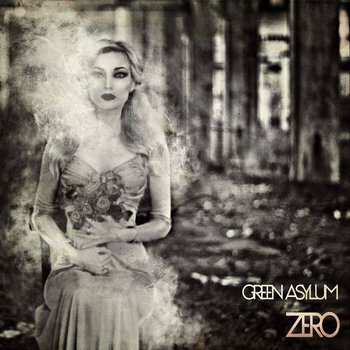 Green Asylum's debut album Zero is a dark and twisted Doom/Stoner Metal ride into the unknown. An album consisting of 6 tracks running for 44 mins or so which will seriously entertain the hell out of you. As Green Asylum lay on the fuzz brutally loud and thick. The album is played low-tuned through out and it gives their album a slight Black Sabbath/Electric Wizard vibe though with hints of Kyuss thrown in for good measure. First track – VII – is an epic track which perfectly sets the mood with layers of demonic fuzz being played to maximum effect with lead vocalist – Michal – playing the frontman with nightmarish charm and a sense of danger around him. If you like your riffs loud, dangerous with a lot of fuzz then Green Asylum are the band for you. Zero has a wicked sense of humour to the lyrics mainly about getting drunk and high with your friends. Especially on one of the album's stand-out tracks – IV – which has a slight Church Of Misery vibe lurking behind the loud fuzzy Doom/Stoner Metal riffs the band are unleashing upon your soul. The album does have a great 70's Doom/Stoner Metal influence to it. You can feel the riffs coming at you from every corner as the band leave no stone unturned in giving you one wild ride from start to finish. Green Asylum have delivered an album that demands to be played over and over again at the loudest volume possible. You may think it's not the most original sound from your first listen but I advise you to listen again as Green Asylum have written some startling and intelligent lyrics that gives their sound a nightmarish vision to it. Third Track – I – has nailed the Doom Metal aspect brilliantly as you feel Michal's pain shouting - “BURN IT DOWN” - over and over again which feels like a cry for help to the Doom Metal Gods. Zero is an album influenced by drink and drugs plus the hazy dark riffs of Black Sabbath. That is one seriously fucked up addiction. Though Green Asylum make ZERO a dark, dangerous and hypnotic ride that will last long in the memory. Zero is an excellent debut album and shows that Green Asylum are a band with a bright demonic future indeed. Zero is available to buy from BandCamp Now.